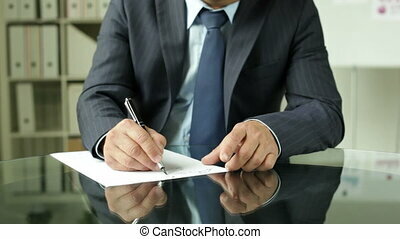 An unrecognizable senior male warehouse worker or a supervisor, writing. 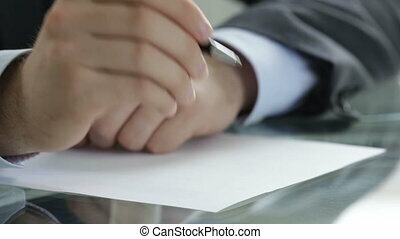 An unrecognizable senior male warehouse worker or a supervisor with clipboard , making notes and writing. 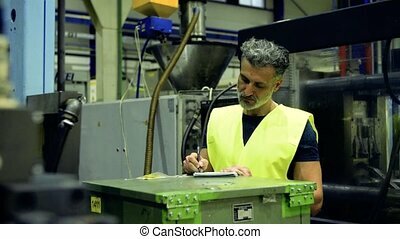 An Unrecognizable Senior Male Warehouse Worker Or A Supervisor, Writing. 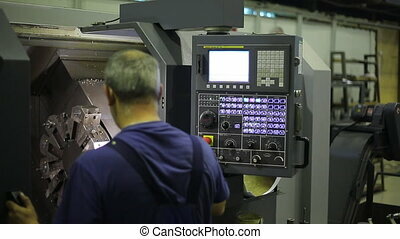 a man of wide-angle precision equipment operator who sets the program for a large machine. In the picture you can see the focus on the remote control of the machine at the factory, standing next to the operator, as we see a large automated system for working with metal workpieces. Probably, it is programmer, maybe he machine operator, senior inspector or just an electrician check the machine after repair. It is the ideal frames to illustrate topics such as set up a high-precision equipment. Also this video shows how well a person can manage such precise mechanism and work on high-tech enterprises, in the video we see a relaxed and intensive work. Great Depth of field and bokeh. 1920 x 1080 FullHD Resolution. 7 second clip. 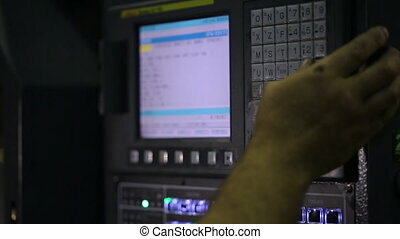 close up of a man precision equipment operator who stands at the helm and sets the program to a large production cycle. In the picture you can see the focus on the remote control of the machine at the factory, standing next to the operator. Probably, it is programmer, maybe he tech machines, the Chief Inspector or just an electrician check the machine after repair. It is the ideal frames to illustrate topics such as set up a high-precision equipment. Also this video shows how well a person can manage such precise mechanism and work on high-tech enterprises, in the video we see a relaxed and intensive work. Great Depth of field and bokeh. 1920 x 1080 FullHD Resolution. 8 second clip. the operator programs the first launch of the automated system of the machine for processing metal. inside cabins on rails moves a huge mechanism with a dozen heads for threading metal, everything is controlled. A slight movement of the camera and a focus is fixed. Console for controlling an industrial machine. 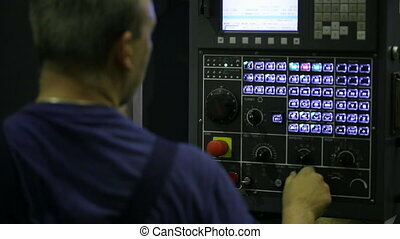 In the picture you can see the focus on the remote control of the machine at the factory, standing next to the operator. Probably, it is programmer, maybe he tech machines, the Chief Inspector or just an electrician check the machine after repair. It is the ideal frames to illustrate topics such as set up a high-precision equipment. Also this video shows how well a person can manage such precise mechanism and work on high-tech enterprises, in the video we see a relaxed and intensive work. Great Depth of field and bokeh. 1920 x 1080 FullHD Resolution. 19 second clip. 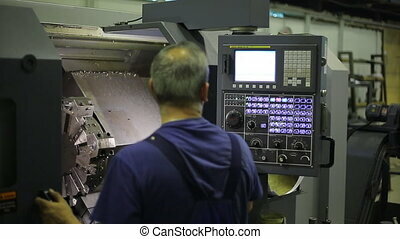 Industrial Machine Operator. 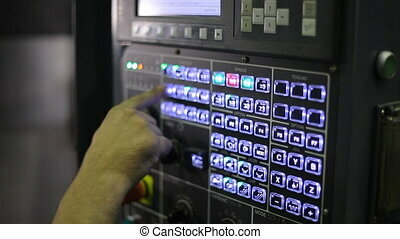 Male worker using industrial control panel of a industrial machine. inside cabins on rails moves a huge mechanism with a dozen heads for threading metal, everything is controlled. A slight movement of the camera and a focus is fixed. Great Depth of field and bokeh. 1920 x 1080 FullHD Resolution. 15 second clip. 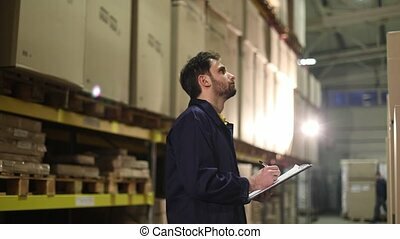 An unrecognizable senior male warehouse worker or a supervisor with handheld barcode scanner, making notes. 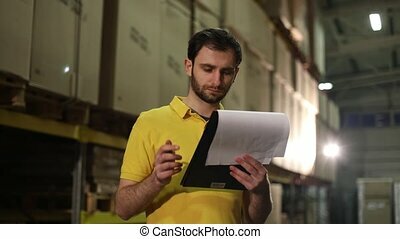 Portrait of a senior male warehouse worker or a supervisor with clipboard, making notes. 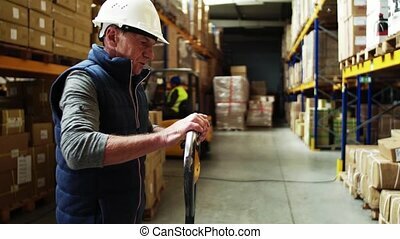 Portrait of a senior male warehouse worker or a supervisor with clipboard standing by the pallet truck, making notes. 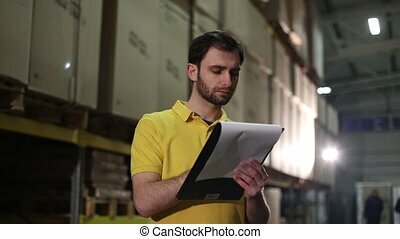 Portrait of a senior male warehouse worker or a supervisor with handheld barcode scanner controlling stock, writing. 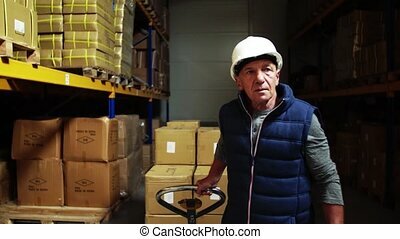 Senior male warehouse worker pulling a pallet truck with boxes. Senior male warehouse worker pulling a pallet truck with boxes. Close-up. 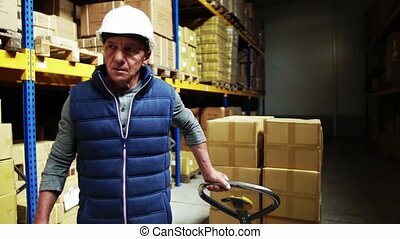 Portrait of a senior male warehouse worker or a supervisor with handheld barcode scanner. Senior woman manager with barcode scanner and an unrecognizable worker working together in a warehouse. 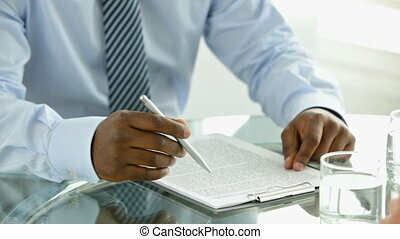 An industrial man worker standing in a factory, writing. Copy space. 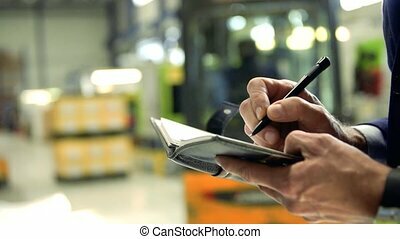 An unrecognizable industrial man engineer standing in a factory, writing notes in a diary. Copy space. 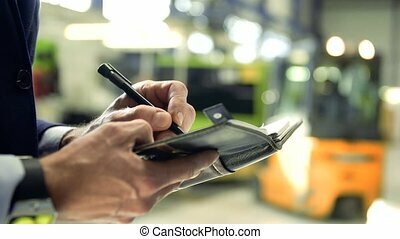 An unrecognizable industrial man engineer standing in a factory, writing notes in a diary. Copy space. Slow motion. A portrait of an industrial woman engineer standing in a factory, talking to unrecognizable man. Close up. A portrait of an industrial man and woman engineers with tablet in a factory working. A portrait of an industrial man and woman engineers with tablet in a factory, working.